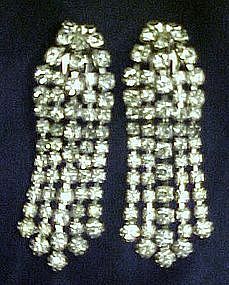 Unsigned clip earrings would go well with most rhinestone accessories. These earrings each have 50+ clear sparkling stones. They have 5 rows of stones which independantly cascade and move. They measure 2 1/2" long and are in pristine condition.